Tikal Mayan ruins in Guatemala. Credit - chensiyuan, WIkimedia Commons. Geology is not just about looking at rocks. From finding oil and gas and tackling climate change to manufacturing, archaeology or geopolitics, geoscientists appear in most spheres of today’s world and economy, albeit often behind the scenes. In a new series of posts we will be looking at how geology relates to interdisciplinary or seemingly unconnected topics, which, at first glance, might seem like they have nothing to do with geology at all. Earlier this year, Iain Duncan Smith (UK Work and Pensions Secretary) had a well publicised clash with geologists after saying in an interview on the Andrew Marr show regarding the legal battle of Cait Reilly – “The next time they go into their supermarket, they should ask themselves this simple question, when they can’t find the food they want on the shelves – who is more important – the geologist, or the person who stacked the shelves?” (see this excellent press release from the Geological Society in response). In way of response to this comment, this series will focus on the links between geology and the wider world and the importance of approaching problems from an interdisciplinary perspective. We hope to highlight the extensive reach of geology and how it can enrich our understanding of topics far outside of the traditional subject area. For our first post in the series we have chosen to look at the pre-Columbian Maya Civilisation, partly inspired by a recent story on the discovery of a large Mayan sculpture in a Guatemalan archaeological site . Tikal Mayan ruins in Guatemala. Credit – chensiyuan, WIkimedia Commons. 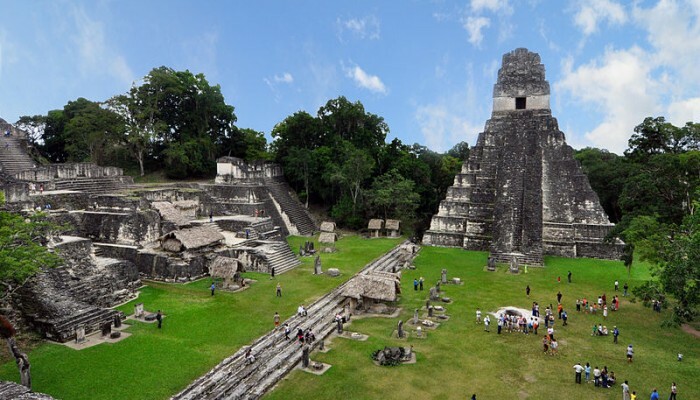 The Maya Civilisation can be traced as far back as 2000 BC and occupied southern Mexico and northern Central America (including the modern territories of Guatemala, Belize and Honduras). It prospered until 900 AD and continued until the arrival of the Spanish. Their golden age between 300 and 900 AD is a period characterised by flourishing art and architecture as well as developments in mathematics and astronomy. Mayan cities are dotted throughout Central and South America, the more famous sites include Chichen Itza and Palenque in Mexico and Tikal in northern Guatemala (see this map of the geography of the Mayan civilisation). So… How does geology relate to this great civilisation? Elements of geology came into the daily lives of the Mayans in many forms through their building materials, the siting of their cities and the materials and minerals they used for trading, building infrastructure and creating objects used in their everyday lives. Climate change may also have greatly influenced the Mayan people and is thought to have led to both the expansion and the disintegration of this civilisation. We take a look at these different aspects below. The name of the city ‘Chich’en Itza’, located in Mexico, means ‘At the mouth of the well of Itza’. This refers to its location close to several ‘Cenotes’ (or in English, sink-holes). Sinkholes are cavities in the ground, often in limestone formations, caused by water erosion – these have received a lot of press recently due to their building swallowing activity! Find out more about sinkholes here. It’s thought that Cenotes provided access to the underworld, due to the discoveries of skeletons in sinkholes and caves near to archaeological sites. The cenotes were also fed by underground rivers, which provided water for the population. Cenotes at Chichén Itzá, Yucatán Peninsula, Mexico. Credit – Emil Kehnel, Wikimedia Commons. Mayan cities grew by using sacbeob (white roads, or limed causeways) to connect great plazas and temples. These were made from limestone due to its ease of handling and local availability. Stone for buildings was taken from local quarries. Limestone was preferentially used because it was easy to remove using the stone tools available and because it could be used to make mortar through crushing and burning. Limestone was also used for both mortar and stucco. Map of Guatemala volcanoes. Credit – USGS, Wikimedia Commons. One might expect a civilisation that prospered over a long period of time to have developed a thriving agriculture to meet the needs of an expanding population. But limestone is the dominant rock type in the area and does not usually generate good soil. Many Mayan cities are therefore believed to have had poor soils which puzzled scientists and archaeologists as to how they could sustain such great cities. In a recent article in National Geographic, it was suggested that volcanic ash had been ‘spectacularly important’ in Mayan agriculture. Recently scientists discovered a distinct beige clay mineral, a type of smectite (the same mineral recently found on Mars! ), in ruined canals at Guatemala’s Tikal archaeological site—once the largest city of the southern Maya lowlands. Chemical fingerprinting techniques were used to show that the smectite at Tikal didn’t come from dust carried over from Africa by air currents as previously thought but from volcanoes within what are now Guatemala, El Salvador, Honduras, and Mexico. The volcanoes in this region are produced by subduction of Pacific oceanic crust beneath the North American and Caribbean Plates. Volcanoes also brought their fair share of disaster to the Mayans. A village in El Salvador was completely buried when the nearby Ilopango volcano erupted in the 6th century A.D, not unlike the more famous Mt Vesuvius eruption in 79 AD, which buried the cities of Pompeii and Herculaneum. 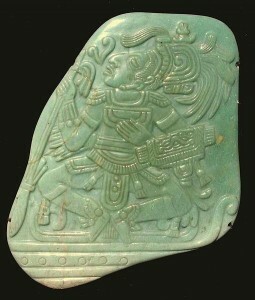 Jadeite Pectoral from the Mayan Classic period. Credit – John Hill, Wikimedia Commons. Trade of commodities and minerals was a crucial factor in Mayan society. Trade centred around foodstuffs and raw materials including limestone, jade, marble, copper and gold. Goods such as jade, pyrite and fine ceramics were used to show power and primarily catered to the wealthy. The minerals jade and pyrite were collected in the highlands of Central Guatemala, made up of two mountain chains running from west to east. The area is made up of large stratovolcanoes and many basaltic volcanic fields (more information on the mountains and volcanoes of Guatemala can be found here). Also important, was the volcanic glass obsidian which was used to make tools for cutting. Initially these minerals were only used locally to where they were sourced, but all of them eventually ended up being traded long distance. The reasons for the collapse of the Mayan civilisation have troubled archaeologists and scholars for years. It has been attributed to a number of different factors, including internal warfare, foreign intrusion, agriculture, disease, environmental degradation and climate change. During the mid 1990s, scholars began to propose that extended drought and lack of water during the period from 750-1000 AD was the principal cause of the disintegration of the major Mayan centres and the collapse of the civilisation. The first geological evidence that this may have been the case came from sediment cores drilled from lakes on the Yucatan Peninsula, now in southern Mexico (and home to the famous Chicxulub crater). 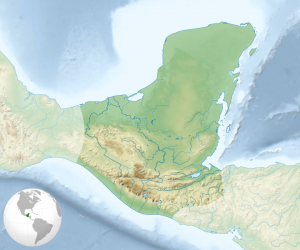 Map of the Maya civilization cultural area. Credit – Sémhur/Wikimedia Commons. In a paper published in the journal Quaternary Research in 1996, Jason Curtis and his colleagues presented results from sediment cores drilled in Lake Punta Laguna in Yucatan. They used the oxygen isotope composition of the shells of organisms found in different sediment layers to show that the end of the Mayan civilisation coincided with consistently dry climate between 800 and 1000 AD, with particularly dry years overlying a general drying trend. The oxygen composition of lake water is an important tool for understanding changes in the hydrological cycle in an area. A molecule of water, H2O, can be made of the more dominant light oxygen isotope 16O or the heavier 18O. In a closed-basin system such as the Yucatan lakes, the oxygen composition of the water (i.e. the ratio of 18O to 16O water molecules) is thought to primarily reflect changes in the balance between evaporation and precipitation. During dry periods, when precipitation is low and evaporation high, the lighter 16O isotope is more easily evaporated and preferentially removed from the water, leaving the heavier 18O in the lake. Dry periods are therefore characterised by a heavier oxygen isotope ratio in the lake waters. During wetter periods, the opposite phenomenon occurs and the lake waters are characterised by a lower oxygen isotope ratio. The oxygen isotope composition of the water is reflected in the shells of organisms alive at each time. As they die and get deposited on the lake bottom, these organisms record a slice of climate information. 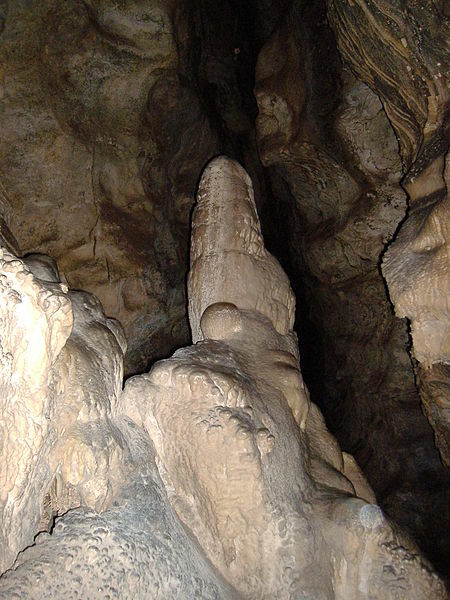 A stalagmite in the Witches’ Cave, Argentina. Credit – Pablo Flores, Wikimedia Commons. This data was corroborated by later measurements in the Cariaco Basin of the southern Caribbean. In a paper entitled ‘Climate and the Collapse of the Maya Civilisation’, Haug and co-authors used the titanium (Ti) concentration of sediment layers to reconstruct the hydrological history of Central America during the first millennium AD. Titanium concentrations reflect riverine input to the basin and Ti is therefore deposited during wet periods, when runoff increases and terrestrial material gets driven towards the coast. The authors also found an extended dry period between 800 and 1000 AD, punctuated by particularly severe droughts around 810, 860 and 910 AD. Last year, a third set of palaeoclimate data was published in Science by Kennett and co-authors. They measured oxygen isotope data in a cave in Belize. Cave deposits such as stalactites and stalagmites grow as water drips through the cave. The oxygen composition of the rainwater is reflected in these deposits and they provide a very high-resolution record of precipitation. Yet again, a dryer period was recorded between 660 and 1000 AD, during the collapse of the Maya Civilisation. So from trade, to religion, agriculture and society, geology has helped researchers understand the evolution and demise of this great civilisation. Having travelled reasonably extensively around Central America in the past few years and explored several Mayan sites, this is a brilliant post! Really enjoyable read. Thanks so much for your kind comment Dan! I spent a summer in Central America a few years ago and loved visiting Tikal and Palenque but wasn’t aware of the climate angle that Marion talked about. Has been fun to take a geo-relevant approach! Thank you so much Dan! I have always been fascinated by the Mayans and remembered a discussion about the link between geology/environmental change and the rise and fall of civilisations around the world in an undergraduate geochemistry class many years ago.. I’d love to travel there some time and observe these myself!